For the past three or possibly four hours I had been wading and casting while knee deep in the clearest, warmest water you could imagine. The size of a football pitch, it wasn’t an especially large flat I was fishing, but with a flat bottom of hard, snowy white coral sand and barely a breath of wind with the hot tropical sun glaring down from its zenith, conditions were perfect for sight fishing with a fly rod. In fact the visibility was so good that at times I could all but distinguish the scale patterns of individual bonefish as they glided past me. Time and time again I watched a fish upend and dig its head into the sand to root out some tasty morsel from the sanctuary of its burrow, its tail glinting invitingly above the surface. I quickly lost count of the exact number of fish I’d hooked, played and landed, but certainly it was a figure that was comfortably in excess of 30. Most were modest 2-3 pounders, but the bigger specimens had weighed the better part of 5lb, and no matter what I did wrong those fish just kept coming. Whenever I fluffed a cast and covered a fish with the line splashing heavily it would instantly spook, only to be replaced by another. 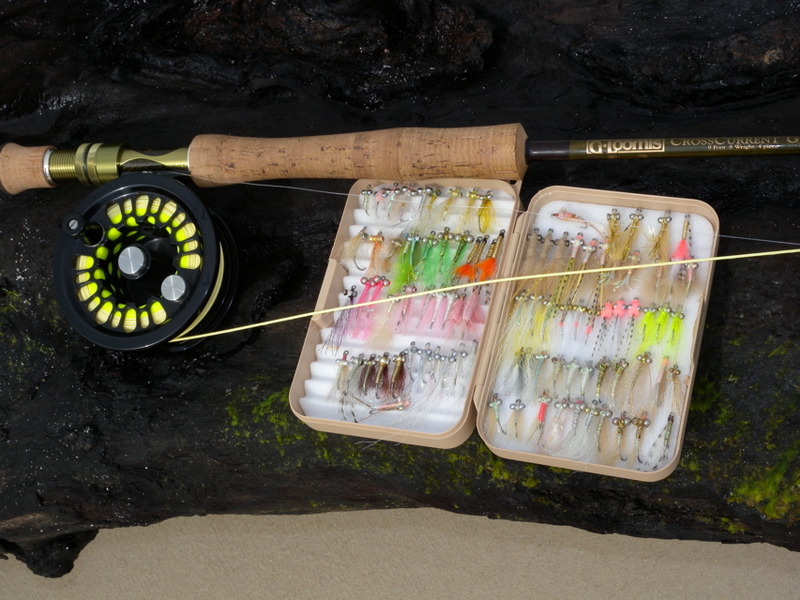 If I failed to set the hook on a running fish, at times a second fish would quickly grab my fly as I started to strip it back. No matter how much I splashed and cavorted about as I played and landed those beautiful ghosts of the flats, they simply kept coming. It was a fly fishers dream, the kind of day that stays indelibly etched in the memory for a lifetime. It was the last full days fishing during a week long trip, and while both regular travelling companion Terry Smith and myself had caught fish each and every day at times, I confess, it had been a struggle. We were fishing in the former British colony of British Honduras, now called Belize, and our Central American adventure had started with a flight to Miami, where we spent a night in a hotel before returning to the airport the following morning for the onward flight to Belize City. Here we connected with a third plane for the 40 minute flight south to Placencia and the final leg of the journey, a 40 minute boat ride through the mangroves to our base just north of Monkey River. Once it enjoyed the status of being classed as Belize’s second city, back in the days when it was a major port for a thriving banana trade, but these days Monkey River can best be described as a ‘traditional’ if somewhat run down town. Monkey River is located at the mouth of the river that bares the same name, and on a clear day you can stand on the beach at the river mouth, look south and see the Guatemalan border, along with the high mountains of Honduras beyond. The following morning we had been introduced to George Garbutt, a likeable and extremely efficient local Creole who would be our guide and mentor for the next week. Weather conditions that first day were far from ideal with a heavy blanket of cloud all but completely blocking out the suns rays, which are so necessary when planning on sight fishing flats. Just to compound things, there was enough wind blowing to prevent us from making the 15-20 mile trip offshore to the Sapodilla Keys. Located at the southern end of the Belize barrier reef-the second largest in the world, the Sapodilla Keys are regarded as being the most productive fishing flats in the area. 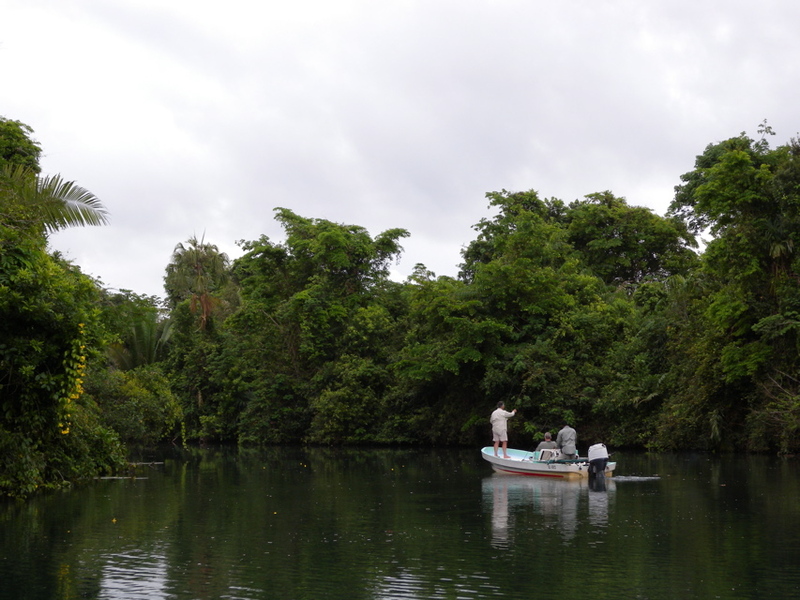 For a couple of hours we had tried fishing a few marks close to Monkey River, mostly small dark creeks that threaded their way through the dense systems of mangroves along with the lower reaches of the river itself, but we caught nothing. Clearly frustrated, George decided to run the gauntlet of the wind and take us north to fish at a few small islands located a couple of miles offshore, where he hoped we would find some shelter. It was an uncomfortable and wet boat ride but finally we arrived at an area that was fishable, and George soon located a shoal of feeding bonefish that gave us some sport. We were not sight fishing as we had planned, we were simply casting our flies into the coloured cloud of water known as a mud. A mud is created by a shoal of fish as they dig about in the soft marl of the seabed, not sight fishing in its purist form, but at least we were casting a fly rod and catching fish. The next few days were equally frustrating and it seemed that each and every time we made a plan to fish a certain area the weather would alter just enough to force us to rethink that day’s options. We spent time up several of the regions jungle rivers catching various freshwater species on small plugs, as well as an occasional snook or baby tarpon amongst the mangroves, but the immensely rich and varied flora and fauna of this lush jungle environment with its exquisitely coloured birds and butterflies, and the raucous calls of howler monkeys ensured our fishing was a memorable experience. 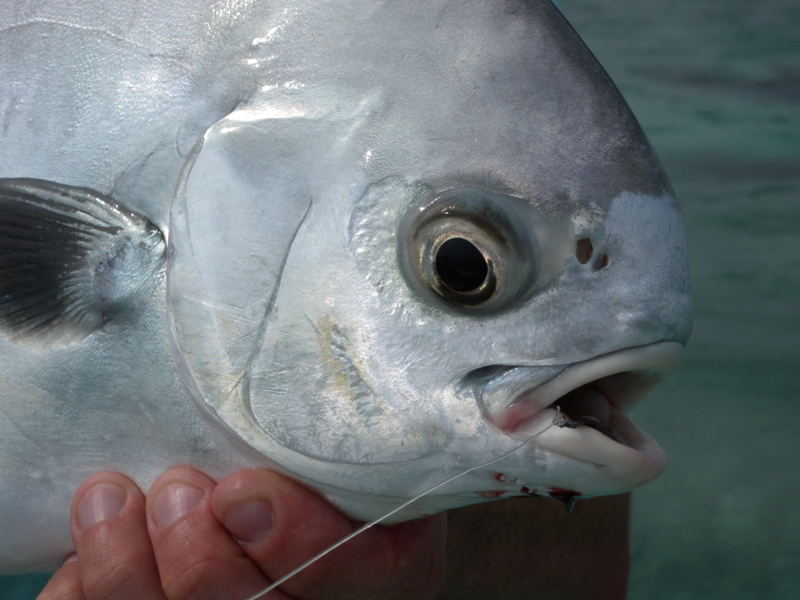 Belize is regarded as being one of the top destinations for anglers looking to catch a permit on fly, and that trip we were both keen to catch our first permit, a notoriously difficult and unbelievably spooky species to catch in shallow water. As the days unfolded we saw many permit and we had our chances, but all had stubbornly refused both our flies and the live crabs and fresh chunks of ‘conch’ we threw at them. Thankfully the profusion of different species of snapper, jack and grouper that inhabited the inner reefs we fished were more cooperative, and ensured that when we returned to camp each evening we had a tale or two to tell. It wasn’t until the last but one day that the wind dropped sufficiently to allow us to venture out to the main section of the reef, and following a few brief stops for a cast or two at a few small islands en-route, finally we made it to one of the many picture-postcard-perfect islands that are found offshore. This particular island was called Ranguana, a tiny island surrounded by a fringe of shallow, wadeable flats that drops off sharply into deeper water. A base for anglers and divers alike who either visit on a day trip or stay in one of two tiny cottages on the island, Ranguana even boasts it’s own small bar that in addition to cold beer and rum cocktails serves a decent selection of freshly cooked meals. Ranguana also offers its visitors some astonishingly good bone fishing. 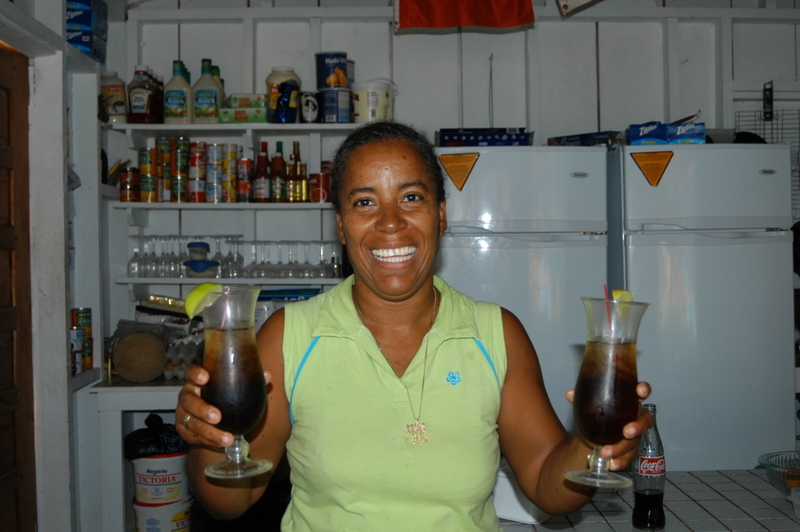 Anyone for a rum n’ coke-the bar at Ranguana! During the afternoon we fished at this tropical paradise we caught plenty of bonefish, Terry fishing with George on the boat, while I waded the shallow water with my fly rod. 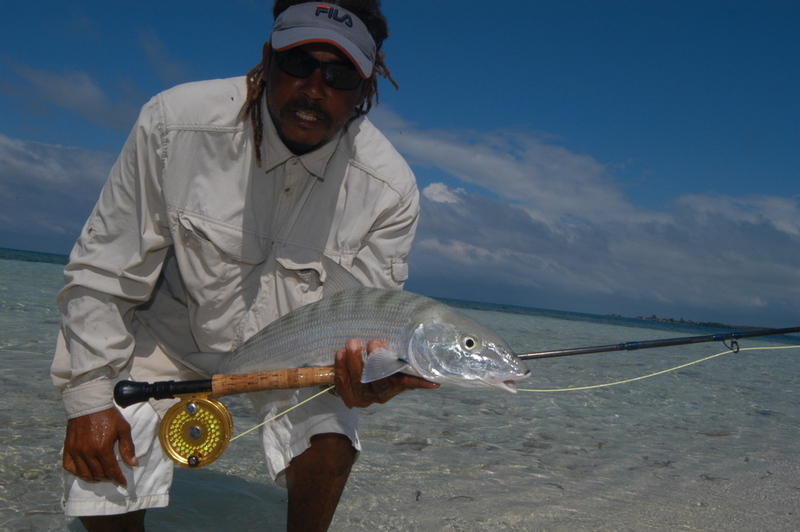 The numbers of bonefish we saw were staggering with shoals of bright, chrome plated fish that numbered into the hundreds. These weren’t especially big bonefish, but they took our flies readily, ran like the wind when hooked, and when finally brought to hand for a quick release glinted like freshly minted coins brightly in the late afternoon sunshine. When finally I could resist the temptation no more and walked up to that small bar for a much needed rum and coke, I wouldn’t have taken much persuading to have stayed on Ranguana for a month! The weather on our last day was perfect, and George was keen to run us out to the Sapodilla Keys for a final shot at those elusive permit. We found the permit straight away, plenty of them, but the closest either of us came to catching them was when one inquisitive fish followed my crab fly all but back to the rod tip, and apart from the gentlest of nips decided it wasn’t for him. The excitement and anticipation as I watched that deep chrome flanked fish follow my fly, it’s ebony black sickle fin slicing cleanly through the glassy surface film was almost too much, I honestly thought my heart was going to give up! Mid-morning we were still ‘permitless’ and recognising our frustration George suggested a loosening up session on a few bonefish, and when we readily agreed he took us to another small island named Nicholas Key, which is where I started this story. As George gently poled us into the shallow water I stood at the bow, fly rod at the ready, and surveyed the snowy white flat in front of us. At first I thought the sand was covered in dense patches of turtle grass or lumps of coral, then finally the penny dropped and I realised I was staring at the mother lode of all bonefish; there were hundreds of them and my hands began to tremble with excitement! Once again Terry elected to fish from the boat, while I waded ashore and commenced what is undoubtedly one of the finest days saltwater fly fishing I have ever been privileged to experience, and proceeded to catch fish after fish that averaged a respectable 2-4lb. The only thing that put the fish off eating my size 4 Crazy Charlie’s and Gotchas was a sizeable barracuda that occasionally drifted in from the edge of the deepwater, floating over the flat like a log, visibly unnerving the fish. Terry, too, had spotted the cuda and when it sliced cleanly in half a bonefish he was playing he decided to do something about it. A quick rummage in his tackle bag produced a wire trace to which he attached a couple of treble hooks and the remaining half of the decapitated and still twitching bonefish. George gently poled the boat to within casting range, Terry lobbed the bloody bait in front of the barracuda, which it took it instantly. For ten minutes or so, during which time I caught a couple more bonefish, Terry fought the fish, George doing his best to pole him clear of the few shallow coral heads that would have cut the line. At one stage the fish had all but stripped his reel of line but his knots were good, the hooks held, the wire did its job protecting the thin line from those razor sharp teeth, and finally they managed to beach the fish. It was a more than respectable barracuda that George conservatively estimated at 30lb plus. This trip the weather was perfect and each day we could run wherever we liked. Knowing it was permit we wanted to catch George ran us due east for some twenty miles, cut the engine and silently we glided up onto the crisp coral sands at the Sapodilla Cayes. As the bow of the boat kissed the beach and came to a gentle stop the sight of dozens of bonefish tailing across the mirror calm flat to our left was such I couldn’t resist setting off with my fly rod for a cast or two. George also waded out onto the flat but unlike me he was uninterested in tailing fish; he was looking for bait. The ultimate way to catch a permit if you are a purist is sight casting with a fly rod, and ultimately that was how both Terry and I wanted to catch one, but up until that morning both of us were permit virgins; we just wanted to catch our first permit. 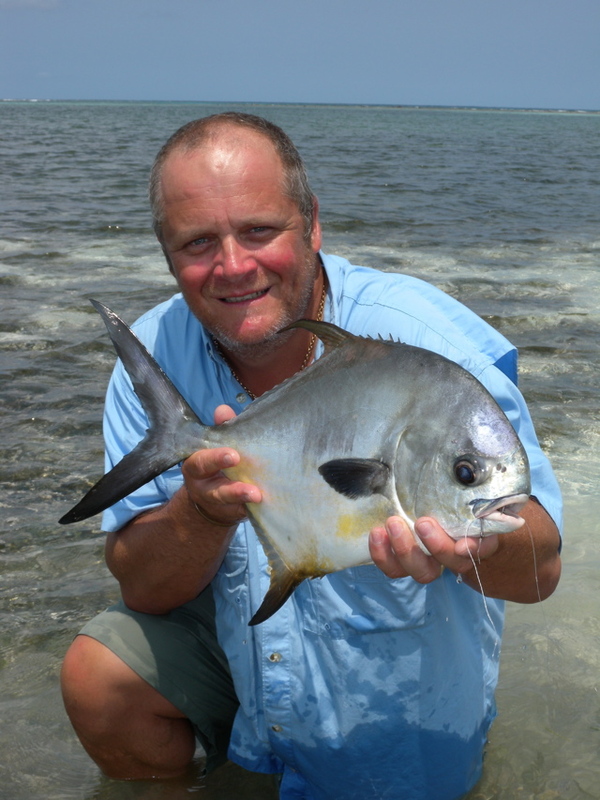 Catching permit in shallow clear water is never easy, some fish seem to spook and disappear in a metallic silver blur even if you ‘think’ about casting at them. However if there is one way of maximising your chances of hooking a fish then it has to be casting a juicy lump of fresh conch meat on a light spinning rod. Pronounced ‘conk’, conch are those gorgeous large, pink hued shellfish that are so typical of the Caribbean, and it was these that George was looking for. In no time at all he had found a few and we motored a few hundred yards out to a large, kidney shaped flat that lay to the north west of ‘Franks Caye’. We knew this was one of George’s favourite permit flats having fished it on our previous trip, and this time as George cut the engine and reached for the long pole with which he would gently push us across the flat he announced that today, conditions for catching permit were perfect. It was Terry’s turn for first shot at a fish and even as he stepped up to the bow, baited rod in hand, George pointed out three black sickle tails that were working their way directly towards us. As George ever so gently inched us towards the perfect spot to intercept the feeding permit Terry stood with the bail arm on his reel open, finger on the line, ready to fire a bait as soon as he felt the fish were in range. Our tactics worked to absolute perfection. First the fish were 100 yards away, then 80 then 50, all of the time swimming in exactly the direction we wanted. When the fish were perhaps 40 yards out Terry lobbed the lump of conch as gently as he could, landing it about 20ft in front of the lead fish. We all held our breath as the school of fish approached the bait, then watched in disbelief as they swam right past it. But just as Terry was getting ready to reel in and recast we watched as one fish abruptly stopped and back tracked towards the bait, clearly having picked up the irresistible scent of fresh conch. At first know one was certain if the fish had actually taken the bait, but then as the fish turned to rejoin the others we saw the slack line that was floating on the surface twitch and start to tighten. As calm as you like Terry snapped the bail arm closed, wound the line tight, set the hook and broke into a broad grin as his light spinning rod bent double the reel singing its pretty tune as a well hooked permit scorched off across the flats. 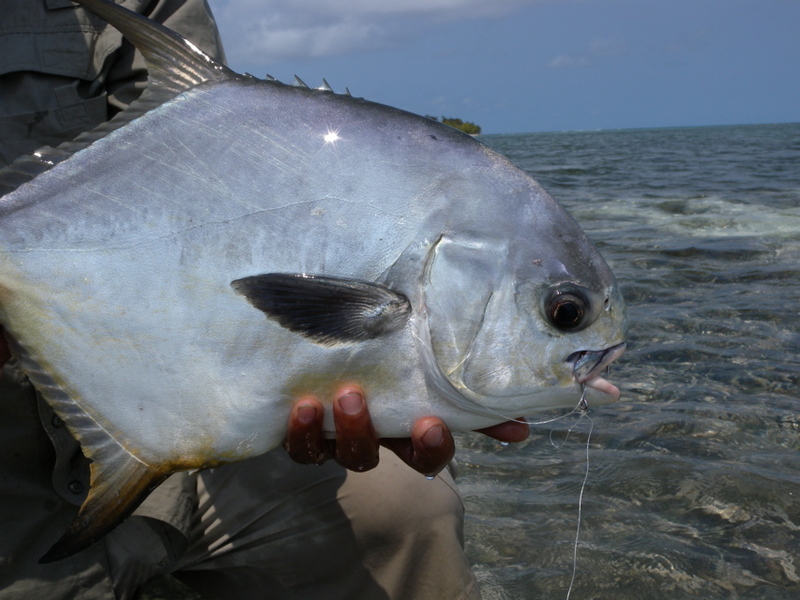 As well as being frenetically spooky, permit are also an unbelievably hard fighting fish, which is hardly surprising when consider they are a member of the jack family. Despite weighing a modest 5lb that fish took almost ten minutes to bring to hand, but eventually George reached down into the clear water and hoisted Terry’s prize aloft. After the commotion we had just caused any attempt of catching another permit from that flat would have been pointless, but one of our favourite bonefish flats was a mere five minute boat ride away so that’s where we headed. 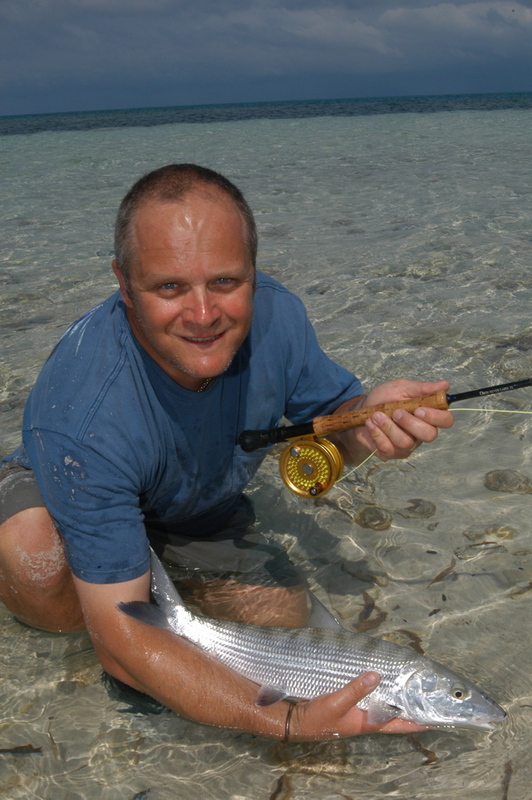 And sure enough we found a big school of bonefish with their heads down and feeding, and during the next couple of hours we flexed both our shoulders and our fly rods and caught plenty of bonefish. Over lunch our conversation had focussed on Grand Slams and we had pointed out that all Terry needed now to complete his first slam was a tarpon. The lower reaches of the rivers back at the mainland offered our best shot at a tarpon, but the nearest river was about an hour and a half away. Both George and I were keen to go and try and get Terry his tarpon, but being the good friend that he is he insisted that first I have a shot at a permit. George took us back to the same flat where Terry had taken his fish that morning, and once again he quietly poled us across the water, only this time I was the one stood at the bow with a rod in hand. For almost an hour we saw nothing other than a few boxfish and an occasional stingray. As we approached the end of the flat, which was marked by two large lumps of hurricane planted timber set at about 50 yards apart, I jokingly announced that with my luck I’d hook a permit right between those two line ensnarling snags! Those words had barely left my lips when George hissed ‘Permit!’ and pointed towards an area of disturbed water exactly where I had predicted, just as the first of five fish upended and waved it’s tail in the air to dig in the sand. Already the fish were well within casting range and as excitedly I fired off a cast the bait I knew it was going to land far to close to the lead fish. Luckily by now a stiff afternoon breeze had rippled the water and somehow the fish didn’t spook as the bait splashed barely a yard in front. In an instant the fish were all over my bait and at first I wasn’t sure whether the twitching I could feel through the line was an actual bite or just fish swimming against the line bite. Then the line tightened, I struck, and finally I was attached to my first permit. Exactly as I predicted that permit swam directly at the branch that lay off to my right, but luckily I managed to turn its head at which point it suddenly changed direction and made directly to the branch on my left, and this time there was no way I could turn the fish without risking snapping the line. As it swam right past the branch it was only a combined combination of George desperately poling the boat in reverse to help my line stay clear of the snag and shear luck that I didn’t loose that fish there and then. Ten minutes later I was cradling my fish, a polished chrome beauty of around 7lb. Now there was no question of whether to try to catch the tarpon to complete or respective Grand Slams, and with barely three hours of daylight left George pointed the bow of his boat towards the west and we headed at full speed towards the mouth of Monkey River. There was, George had already briefed us, a very special place, a secret hidden lagoon that almost always held a good head of juvenile tarpon, hungry tarpon that invariably attack at any fly or lure an angler cared to toss at them. So special is this place, George had told us, he only ever takes anglers there who are looking to catch a tarpon to complete their slam. By the time we headed into Monkey River both Terry and I had re-rigged. I was ready with my 9wt fly rod, the leader terminating in that classic tarpon fly, the cockroach, Terry had his spinning rod re-armed with a small floating Rapala minnow. We headed upriver as we had many times before, only this time after about half a mile George throttled back and pointed the bow towards what at first looked like an impenetrable wall of jungle. Only when we got close could we see that actually hidden behind the dense wall of tangled foliage was a small creek, a creek so narrow and overgrown it was barely the width the of boat. George cut the engine and trimmed it up, then using his pole forced us through the dense curtain of green foliage and into the narrow creek; obviously we were the first boat to attempt this for many months. For the first 20 yards we half poled half pulled our way through dense vegetation, all three of us getting heavily showered in dead leaves, spiders and whose knows what else. Eventually the creek opened out slightly and we could see it fed out from a small lagoon, an open expanse of dark, tannin stained water about the size of an average suburban garden, and in that lagoon we could see the tarpon we both so desperately needed. I had won the toss for first cast, but just how the hell I was going to work a fly rod within the confines I was now standing seemed a daunting if not impossible task. There they were, just as George had promised, at least a dozen sleek tarpon lying motionless on the surface as they absorbed the last of the late afternoon sunshine. As I watched one fish broke ranks and with a lazy kick of its tail glided effortlessly forward to engulfed a small minnow. All I had to do was cast my fly as gently as possible towards the shaded back edge of this hidden lagoon, strip it back in front of those fish, and then firmly set the hook if one took. If I hooked up I knew I would have to hold on as tight as possible, as the second the fish felt the hook it would explode into the air. Both my first and second cast ended up hanging in the trees but somehow the third cast fell just right. Two strips of the line and wallop, the water erupted as a tarpon engulfed the fly in a gill rattling, head shaking explosion of sparkling chrome and spray, shattering this tranquil jungle scene before setting off around the lagoon in a series of violent head shaking jumps. Luckily the fly had found a firm hold inside the fish’s rock hard jaws and miraculously the fish did not snag my fly line around the dozens of available snags. A few arm wrenching minutes later and George was holding my tarpon, an eight pounder, alongside the boat. My Grand Slam was complete and with shaking hands I fumbled to get my camera to record the event, but just as I was ready to press the shutter the fish flapped and George lost his grip and it fell back into the water, but who cares, finally I had done it, angling’s equivalent of a ‘hole-in-one’! Meanwhile Terry had made a cast, hooked a fish, and lost it as it straightened the hooks on the lure he was using. There were still plenty of fish cruising so he offered me another cast while he re-rigged his lure with stronger hooks. I made a cast and quickly managed to catch a feisty two pounder that did hang around long enough for a picture. Sadly during the next 30 minutes before we finally lost the light Terry hooked four more tarpon, all of which came unstuck. 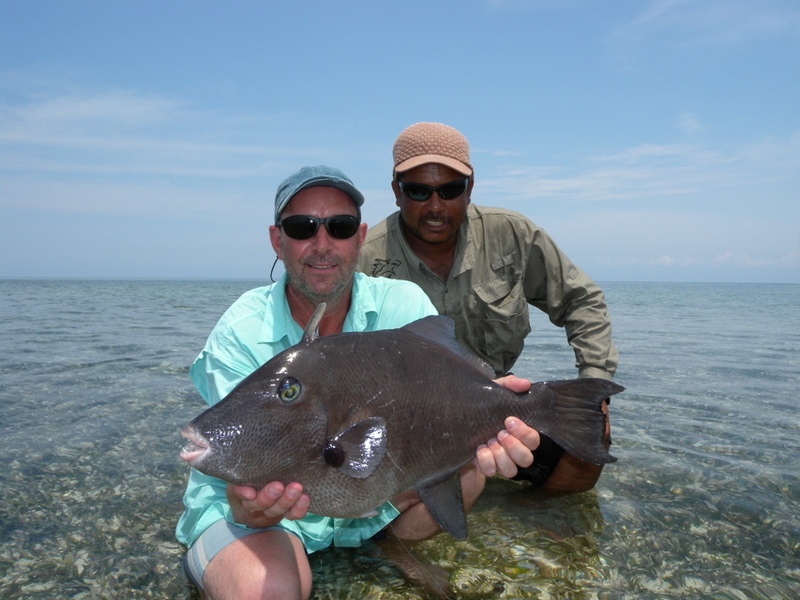 Late in the morning the following day Terry caught his second permit, along with a huge oceanic triggerfish. 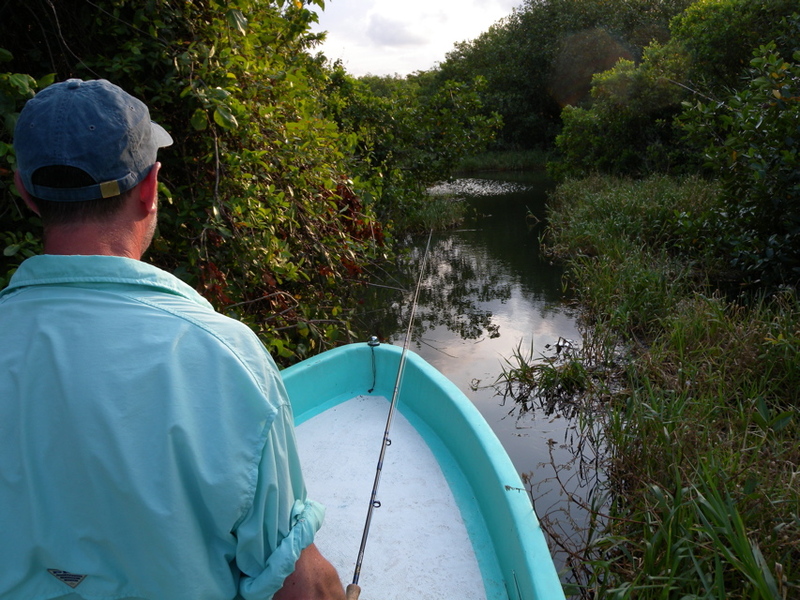 As we both had already caught bonefish we once again headed for George’s secret tarpon lagoon in the jungle. This time luck was on his side and using his fly rod he completed his Grand Slam. The fishing in Belize is good year round, though visitors should be warned that hurricanes are possible from July to late September. Most anglers’ visit between October and June, the first trip we went was in November, the second May. Rain is possible at any time of the year but especially from June through October, so be sure to carry a light, waterproof jacket. Belize is widely regarded as being a very safe country to visit. As an ex-British colony Belize still retains a small British military presence, but normal precautions should be observed in larger towns and cities, especially at night. A decent insect repellent is an absolute must. We tagged a three day extension to visit the Maya ruins at Tikal, Guatemala, onto our trip, and this I would thoroughly recommend to anyone. 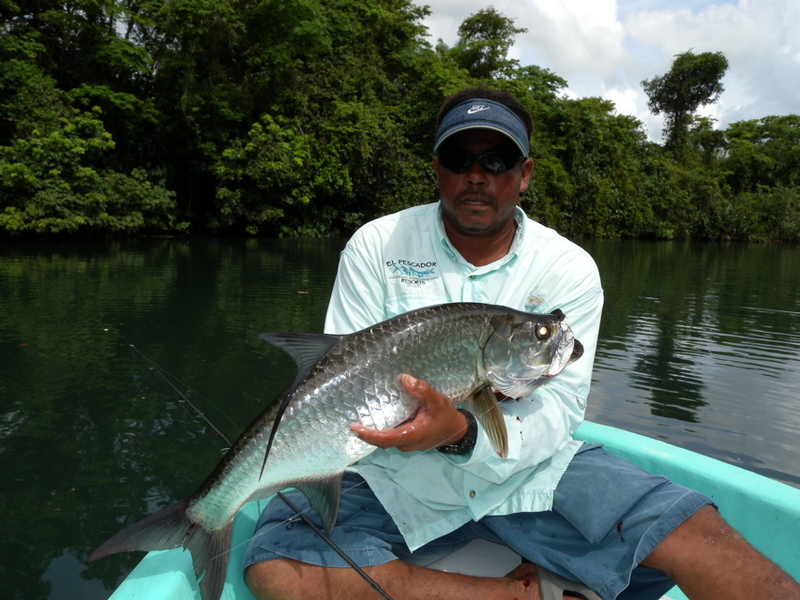 I was out in Belize over Easter and fished with George for 4 days while staying out on Water Caye.I’m already planning a return next year and on George’s advice he tells met that Placencia/Monkey River is the place to go.My first week was up at Ambergris Caye where I caught my first bonefish on the fly.The barracuda were a pest stalking the schools of bones,but I managed one of over 40lb on a surface plug,plus a few more smaller ones. 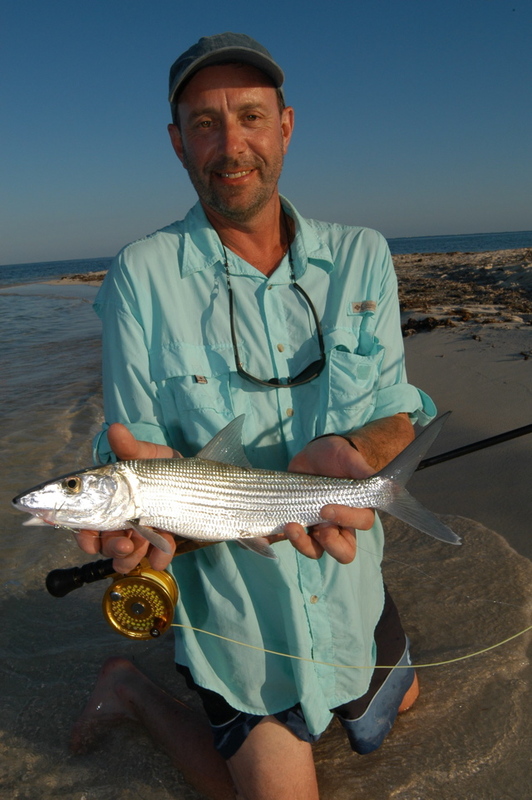 Certainly there were more bonefish fishing out from and around Water Caye. But the permit eluded us due to my not very good presentation and a swing to the north in the wind direction which took the water off the flats. Any advise on Monkey river wrt accommodation etc. would be appreciated as I want to see some of the Mayan ruins which my wife went off to explore while I was fishing. Good luck on the ‘retirement’ .. I guess you will be busier than ever now!